Who says you can’t decorate 70 square feet? 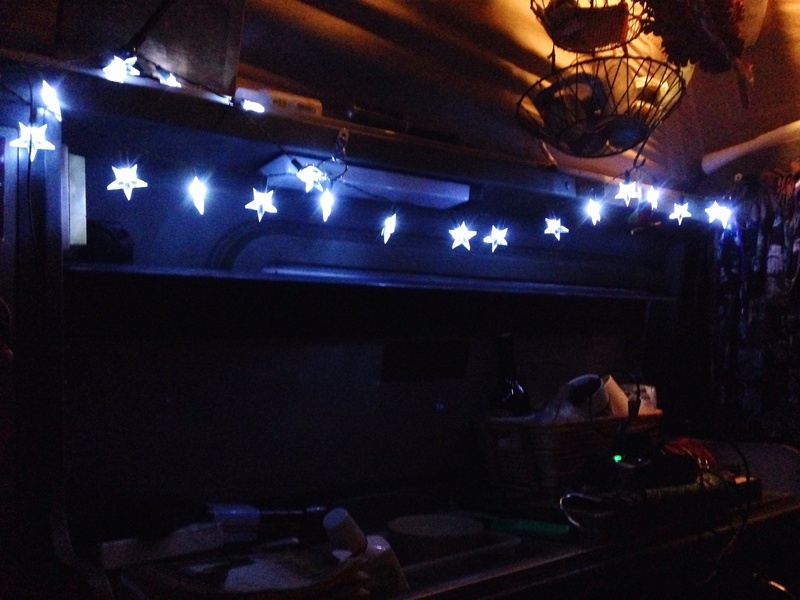 One simple strand of battery LED lights go a long way inside this tiny house, and adds an incredible amount of cheerful bright light. We are back in Santa Cruz, spending this time of year with our family and friends, while taking a short break, house and kitty sitting for dear friends for a few weeks. We wish everyone out there in Blogland a very happy Holiday Season however you happen to spend it. Driving or walking along the streets of San Luis Obispo, one cannot help but notice Volkswagon busses, bugs, and campers of all sorts and all ages parked in driveways on every street in every neighborhood. Not only are they parked all over the place, but they are in prime condition – shiny, clean, loaded, and with pride written all over their smiley faces. I have a hunch the VW owners in this town, not only love their vehicles, but that they engage in a bit of classic car competition around here. It’s not surprising really, since this is also the land of Go Westy, the notoriously famous Volkswagon Vanagon and Eurovan parts, gear, and toy provider, and notably the most famous and complete VW camper van restoration folks in the U.S.
We had to pay them a visit, which provided us with loads of fun, checking out all the different vans and being treated royally to a private tour of the back, where old loved vans, are reborn from the bottom up to morph into like brand new camper vans and weekender vans after complete restoration work. We’re about to head up to Santa Cruz, but the van won’t let us. It’s pinging and knocking. We fear the worse, that it’s the engine, but really we think it’s mechanical issues stemming from the driveaxle that was replaced back in Tucson, which I wrote about here. We’re so close to home, but don’t want to take this ailing van up crazy curvy highway 1 along the coast in this rainy weather. We have to get it checked out again. Geico…Hello…Are you home??? Not really, as it take us a day and a half to get a response from the good ole insurance company, and get an ok to have someone take a another look at the work done by the Tucson mechanics. The first shop we go to tells us to just drive it on to Santa Cruz, the second place Geico sent us, said there was no problem. Everything looked fine they told us. We try heading out of town again, but the grumbling unhappy noise still insists we don’t go too far, so we decide to have it checked out this time on our own by a real garage, a european auto repair garage. Another very long story, another week long wait, but these european mechanic folks know their business. It seems that the Tucson mechanic improperly installed the drive axle with too long of bolts, causing the loose axle to beat the heck out of the transmission case, shredding it to smithereens. So now we not only needed another new axle again, but in addition we needed an entire new transaxle replaced! Which leads to the fact that Go Westy, remember, just a few miles away, happens to have a shelf full of rebuilt Eurovan transmission/transaxles that are not only rebuilt, but rebuilt with cooling components much better than the original trannies. And that folks, is our unexpected Holiday Gift! We now have an almost brand new vehicle, stronger than ever, and raring to go, with a new left axle, the new entire transaxle, more new ball joints, and a new oil seal, to stop a small leak we had, all thanks to the poor workmanship in Arizona, the fantastic workmanship here in San Luis Obispo by Jim, Tucker, Taylor, and crew, and our insurance company who stood behind the warranty. Not a penny out of our pockets was spent. 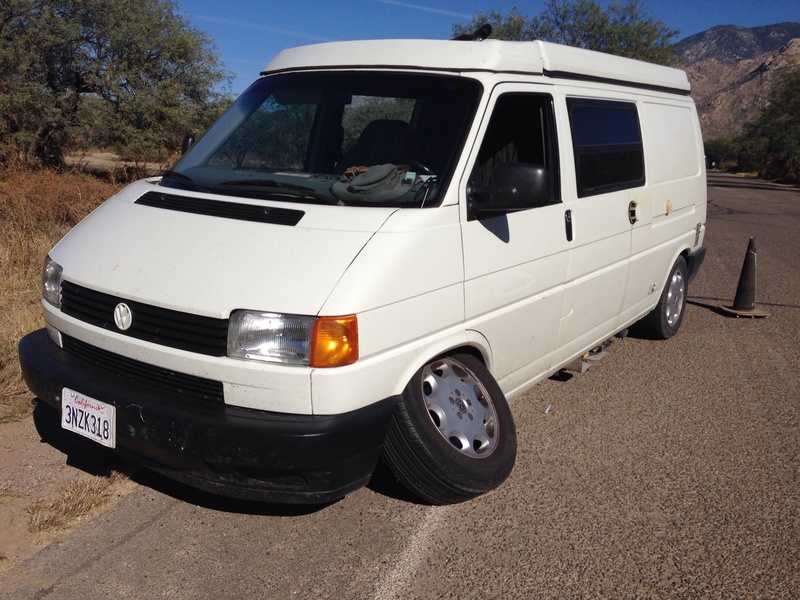 Arizona may be a horrible place to break down, but seriously we couldn’t ask for a better place than San Luis Obispo to break down a second time, this land full of fantastic mechanics and more volkswagon parts than one could spend a week dreaming about. The best customer service, the best mechanics, and the place everyone goes back to is German Auto of San Luis Obispo. We’re pretty proud of Ms. Keevan for putting up with all of this. And we’re all very happy to be back together again! 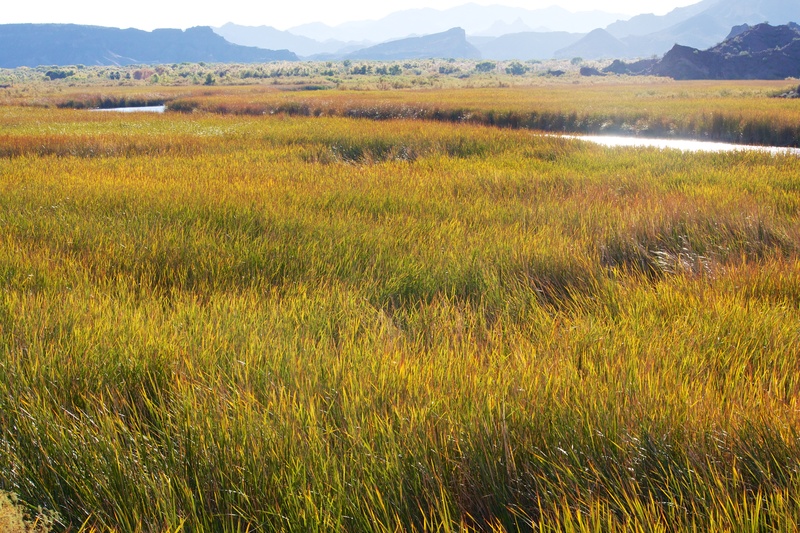 We drove up along the lower Colorado River, enjoying different scenery and marshes like this one around Parker, Az. Laughlin, Nevada, was actually a pretty cute town, for a gambling town. 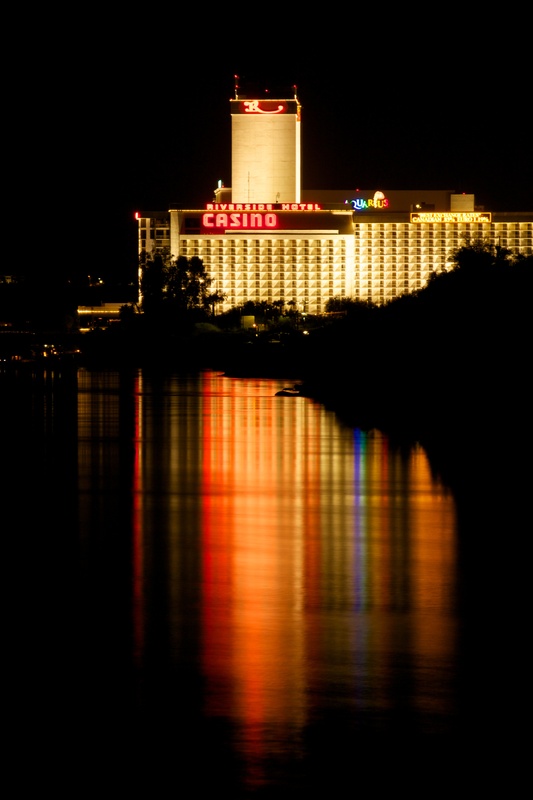 We camped almost in town, right on the Colorado River, with this view of one of the casinos from our van door. That was a first – after so many mountain and scenic river views. It was fun to have such a different view, with it’s own type of beauty with all that color reflecting on the waterfront. 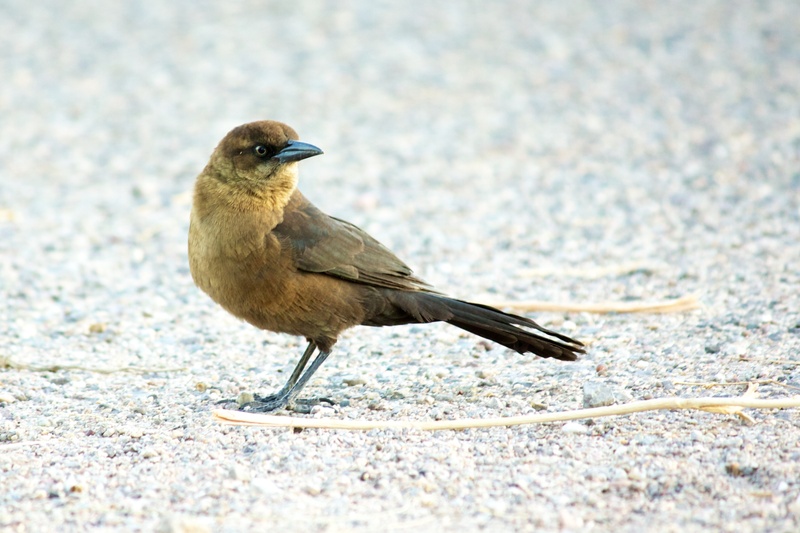 Along a good portion of our trip, we’ve thoroughly enjoyed the company of these Grackles. We loved their voracious voices and extended sing-song vocabulary dearly. Sunsets and sunrises among them always made us feel like we were in a tropical jungle. 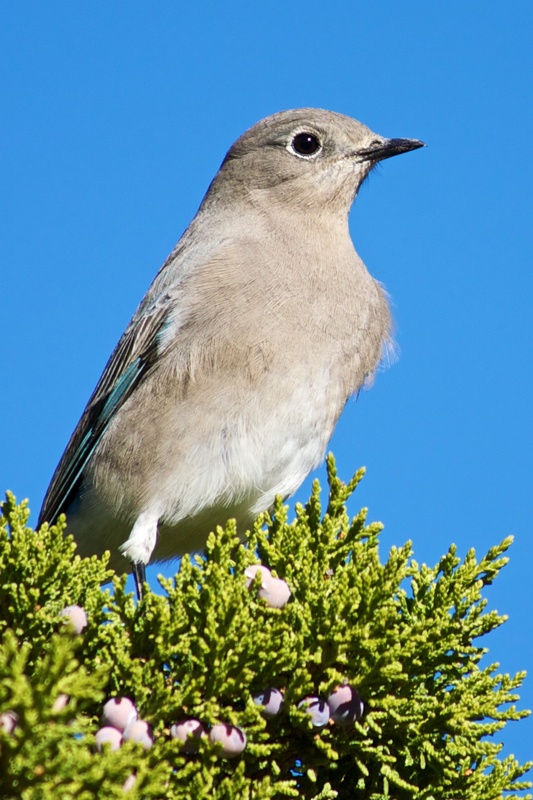 So long little Grackle birds. We’ll miss your humorous stories. 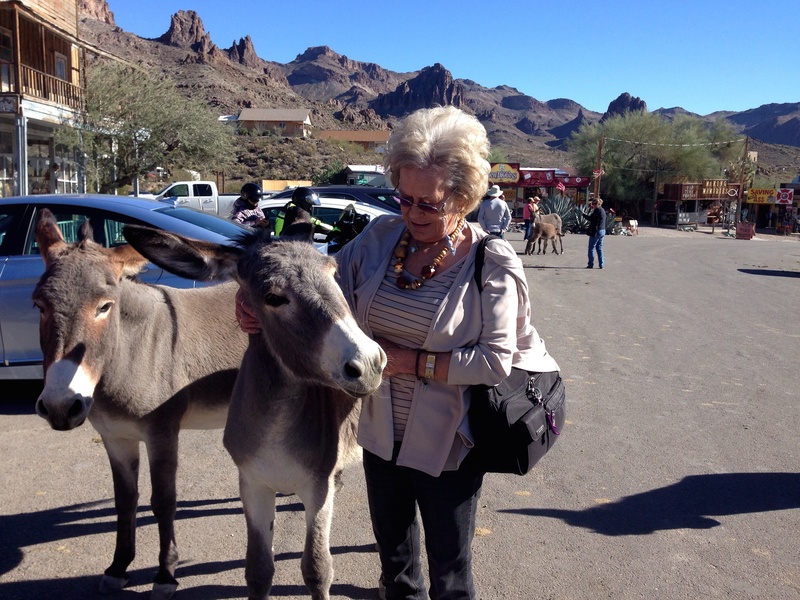 A little excursion was on the agenda, for a visit to Oatman, Nevada. 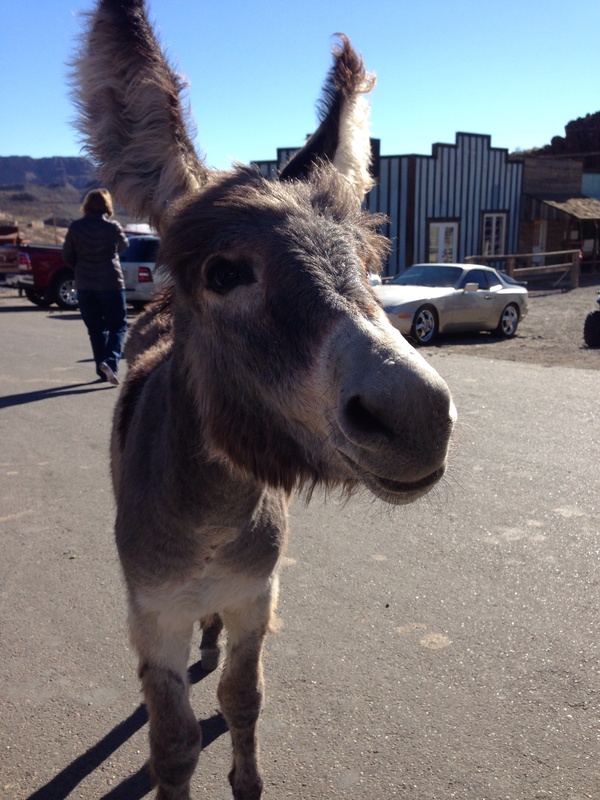 Oatman is another old western mining town, but this town has an added attraction. 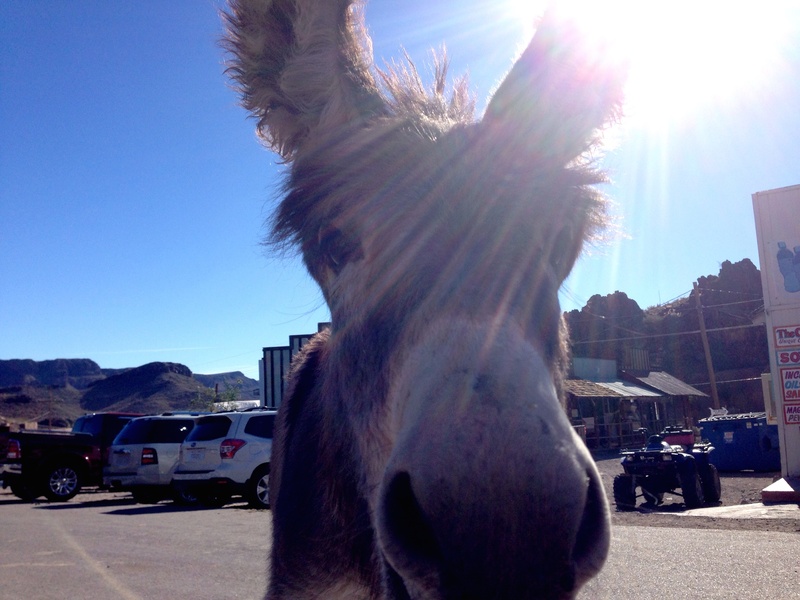 These cute little wild burros pretty much rule the streets of this town. They are “wild” burros, but have become quite comfortable in town, where the tourists and locals alike feed them and watch over them. Better make sure that purse is zipped up or they will have their noses stuffed into it in no time. And they act like a football linebacker if you happen to be carrying around a bag of carrots. We enjoyed spending time with some extended family, waiting for their car to get repaired. We actually crammed four adults along with Pia and all our stuff into Miss Keevan for the ride, which was a feat in itself. Oh yes…the night before we left town, between Fred and I, we won enough in the casino to fill up our gas tank for the next leg of our journey. 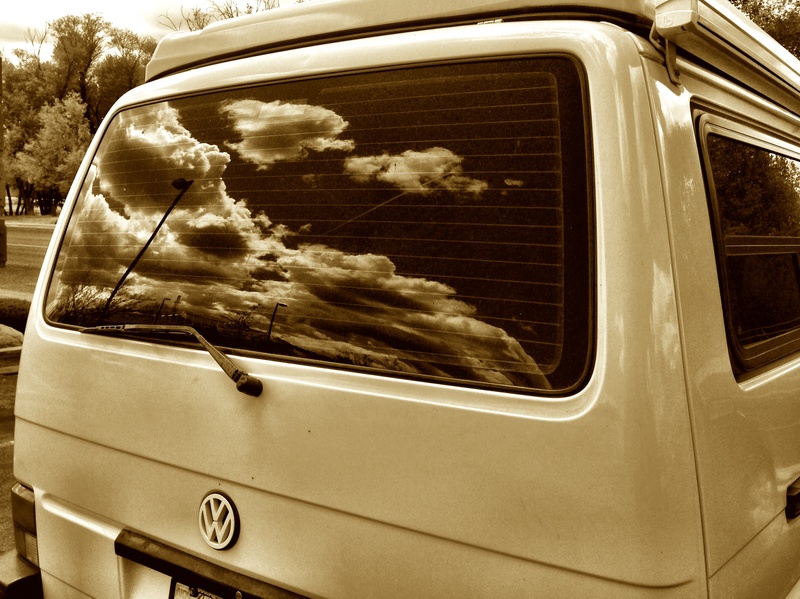 It seems that no VW long term journey is really complete without at least one good breakdown story. 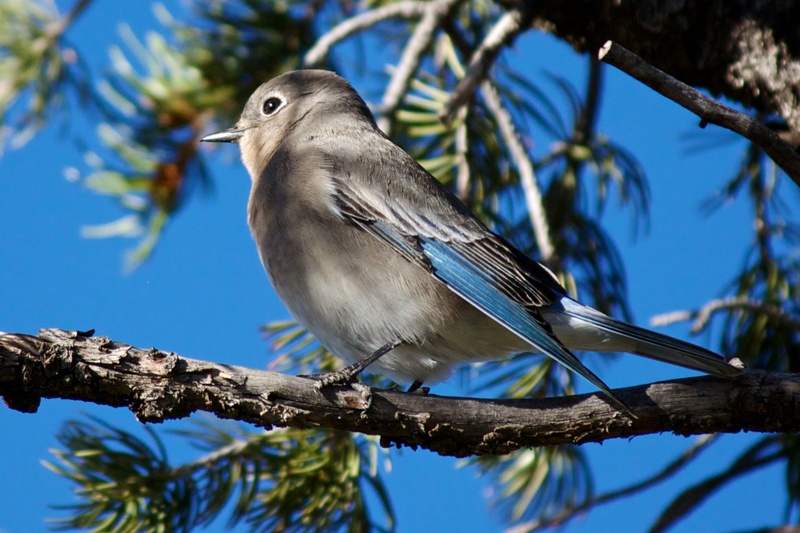 You see, back in New Mexico along that wonderful Rio Grande River, one evening Fred sort of backed the van into a tree while we were getting set up for a night’s camping. Not a really bad encounter, but enough to mush up the bumper pretty good and ding up the back hatch door. 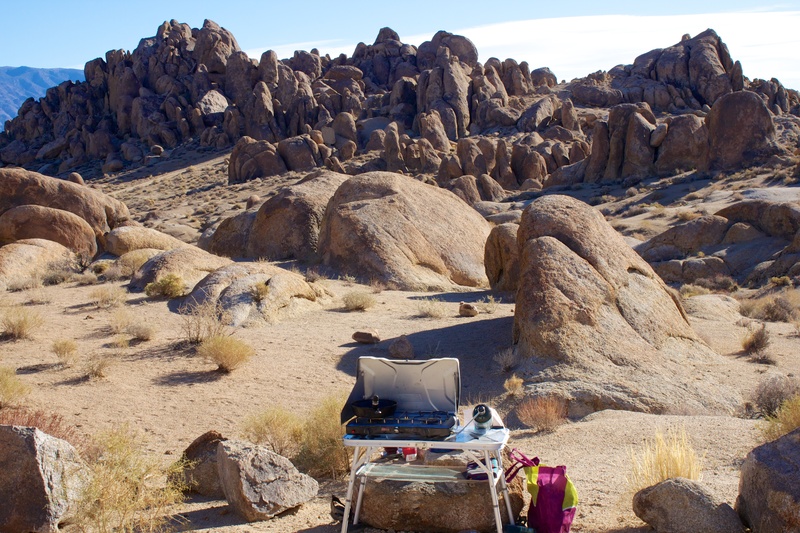 We did the proper thing and eventually turned it into our insurance, which promptly gave us a $900.00 check to go with our $500.00 deductible, to fix it at our leisure, anywhere between New Mexico and California. Sweet. We decided to get it fixed when we got to Tucson. 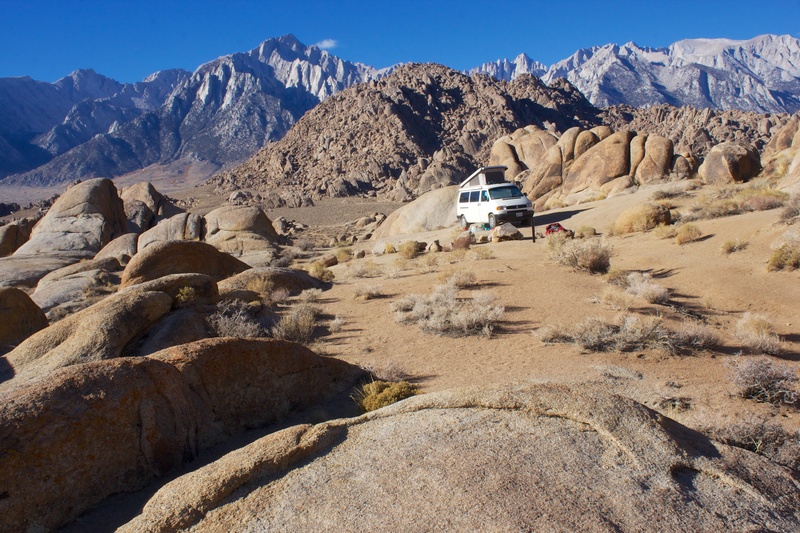 In fact, when we got to town, we arranged for an appointment, and for the Collision Center to get the parts before the appointment, since we would be without our home for three to four days and have to stay in a motel. All’s well. 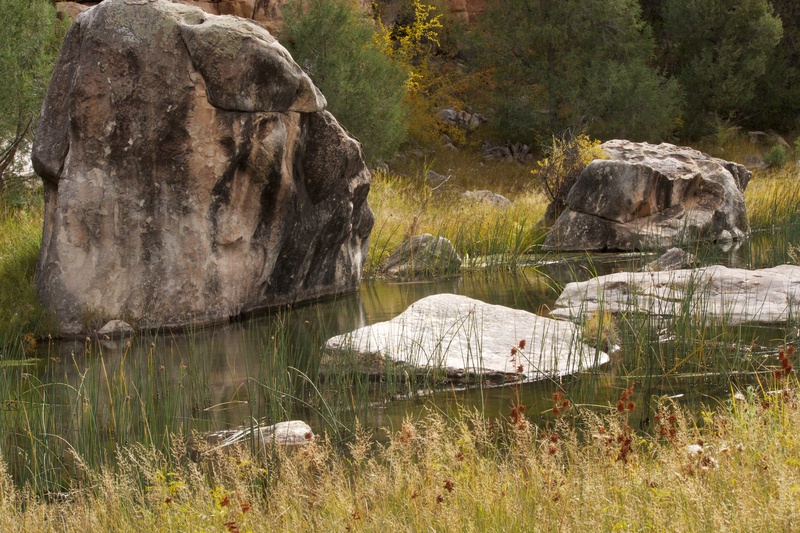 We stayed out at Catalina State Park for the weekend, until our Monday appointment. On Sunday, we decided to run into town, just a few miles up the road to get a few groceries. We only made it around the first corner out of the campground. Bingo! Crash. Bam. What the heck. Our front ball joint just broke. The wheel fell off, and ugly oily stuff was leaking out the bottom. It was hot. AND it was Sunday. Never, ever have a breakdown in Arizona on a Sunday. After a very long wait, one park ranger, and two different Arizona highway patrol officers, our awesome tow truck driver arrived and artfully and skillfully got this mess up on his truck bed without damaging the entire front of the van. In Arizona, nothing is open on Sundays. 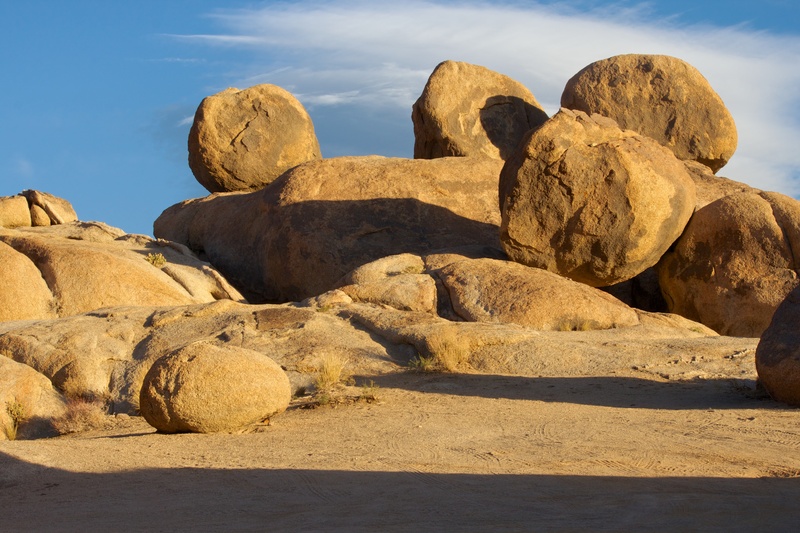 No auto dealerships, no repair shops, and after noon, no rental car companies. Yikes. We managed to get into our motel room a night early, and thanks to the campground host, our stuff back at the campsite was safe and secured. Monday was slightly better, as Geico gave us a nice 2014 GMC all wheel drive SUV for as long as we needed to drive around at no charge. Fun. Of course, now the back collision work can’t be touched, until the front is fixed so the vehicle is mobile. 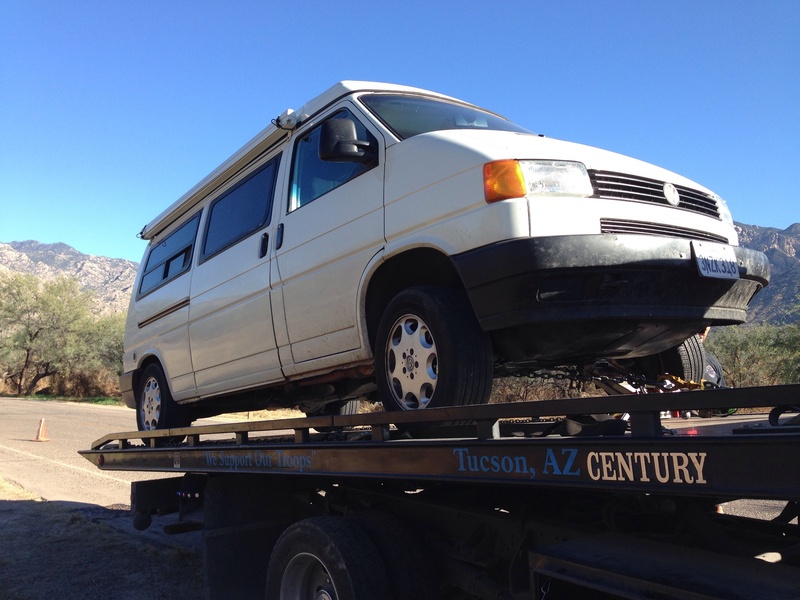 Very long story, shortened for this post…is two garages, different mechanics, one ball joint, one CVC and shaft, a new seal, and some new gear oil, and 11 days later, our beloved van is again on the road. Our insurance covered the second incident as well, but the rear end crunches are still not fixed. The first garage sent the parts back, when the van was moved to the second garage, and after 11 days, we really wanted our home back more than we wanted to wait around another week to get the back damage fixed. So we’ve put that off until we get back to California in Dec. to deal with. 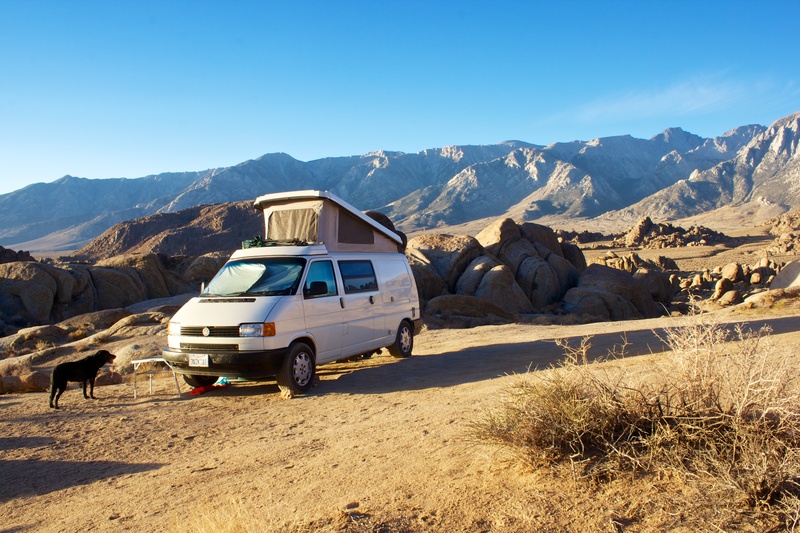 During this time of van repairs, we had also arranged to meet up with some family in the little town of Laughlin, Nevada for a few days for a pre holiday get together. We were on a minute by minute standby, waiting for the van, and after waiting for us for a couple of days, they had to head home. No meeting up with them. But wait, on Thursday afternoon, moments after we picked up the Keevan, they called and guess what? Their car broke down. In Laughlin. Geeze…Friday we headed up there for our visit as now they were stranded for the entire weekend while the garage was closed. We had a lovely visit with them. And we had lots of fun in Tucson, got to visit another cousin of mine up near Phoenix, see some sights, and feel like locals for awhile. 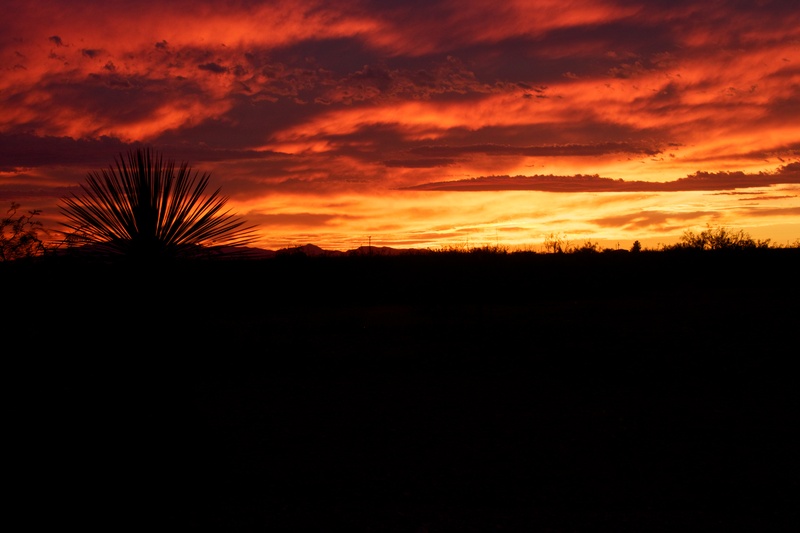 And enjoyed some more beautiful Arizona sunsets. 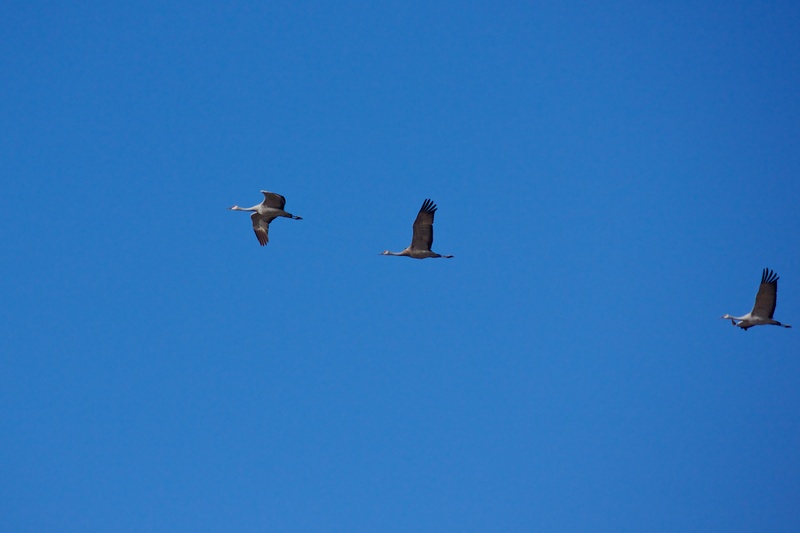 We were too early for the Festival of the Cranes, but we did make it to Bosque del Apache National Wildlife Refuge outside of Socorro. 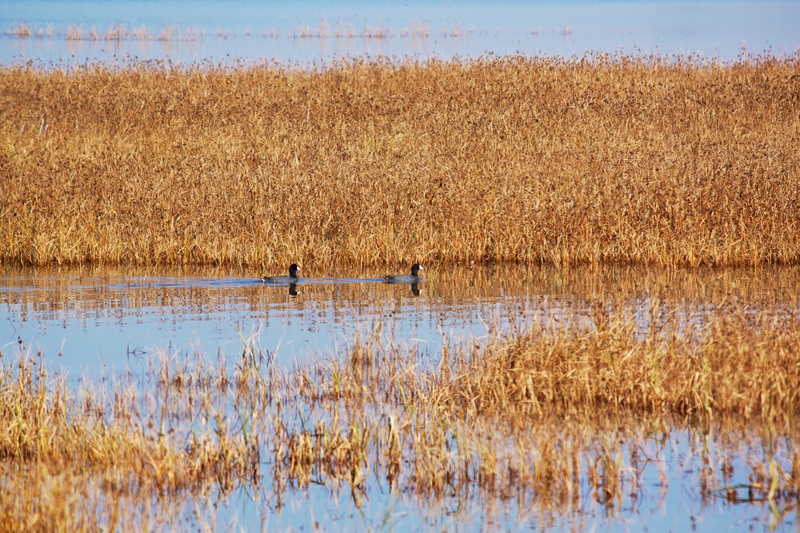 This Refuge is the home to 17,000 wintering Sandhill cranes, along with numerous other waterfowl, birds, and mammals. Not bad scenery either! We had been seeing Sandhills sporadically along our entire trip, so it was a real joy to finally see their most popular wintering area in the US. 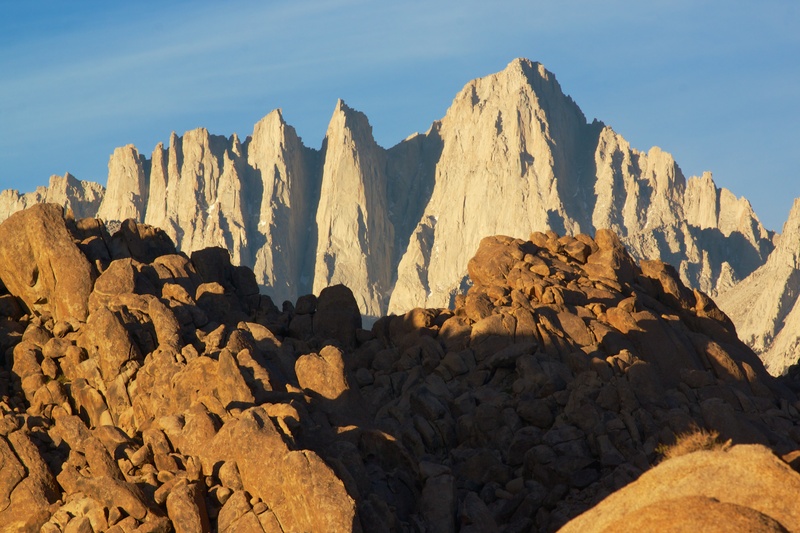 We meandered through Truth or Consequences and Las Cruces, before finding ourselves in the Organ Mountains…more beautiful majestic rocky crags. They reminded me of the Grand Tetons on a smaller scale. 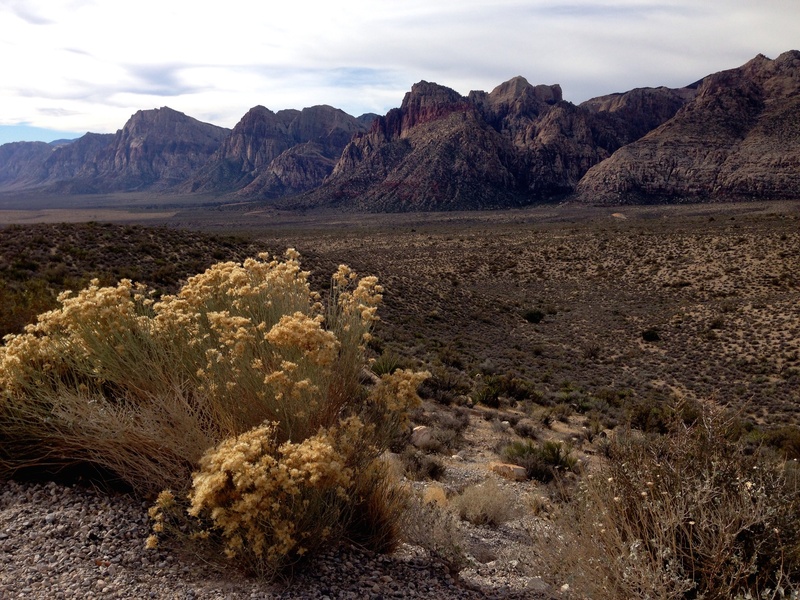 We camped there at Aguirre Springs and hiked up to incredible vistas and meadows filled with wildflowers. Pulling ourselves away from this beauty, we stopped in for a visit to White Sands National Monument. Glad we didn’t pass this gem by. There was a storm on the horizon, and we just made it out before the the rain starting pounding down. The sand dunes are huge mountains of white gypsum sand. Growing up along the ocean, this sand was very surreal to me, it was so white and clean and dry. Very different from my ocean sand. Whenever we pass through a town where either of us have had ancestors living, we try to stop in and visit. 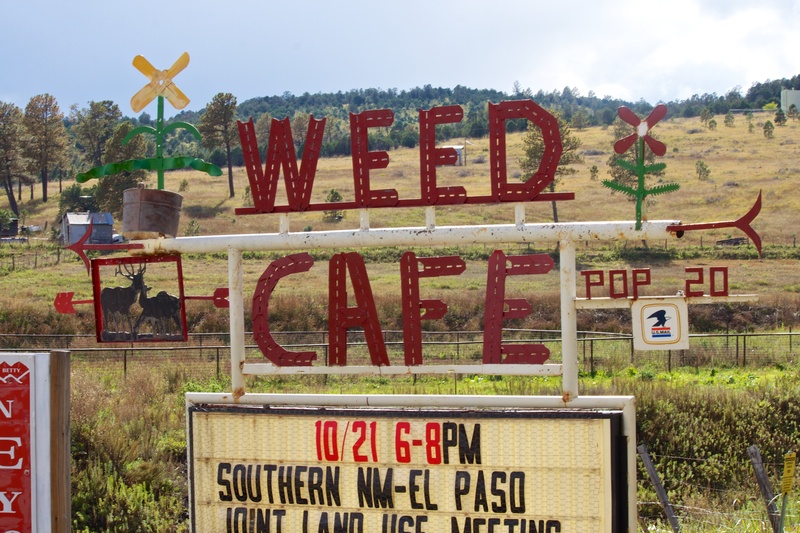 This cute little town of Weed, New Mexico, once held the lofty name of Garden City. Always one to feel sorry for the underdog, I kind of like the name Weed. The population of 20 was stretching it a bit too. We met half the population, and they were all awesomely nice. 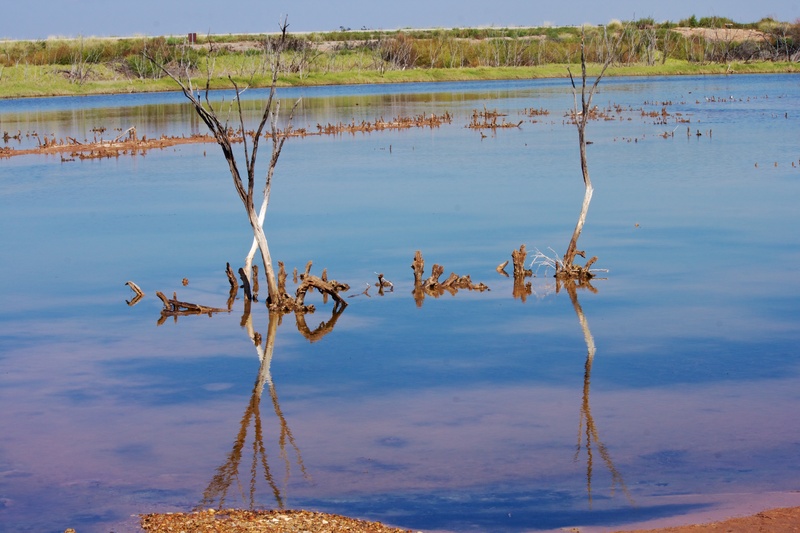 A stroll along another wildlife marsh. Can’t seem to pass these by. 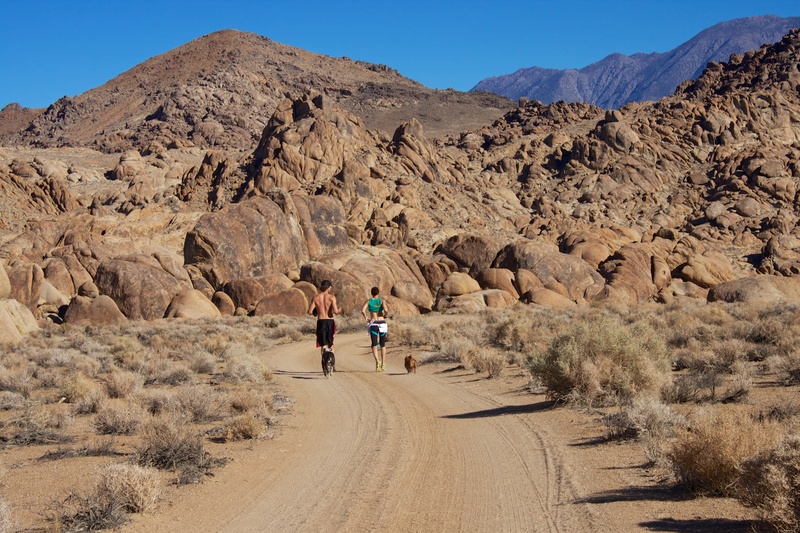 And amazingly they are great places to walk a dog. Leashed of course! 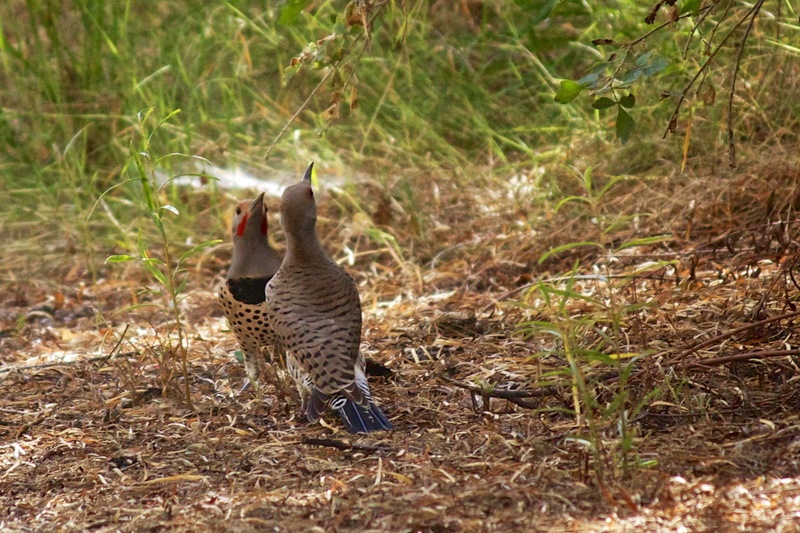 Hiking around a bend out in front of Fred and Pia a bit, I caught these two flickers doing a courtship dance. What a treat! A quick jaunt through Roswell and a visit with some aliens from the Area 51 site, also know as the Roswell UFO incident. 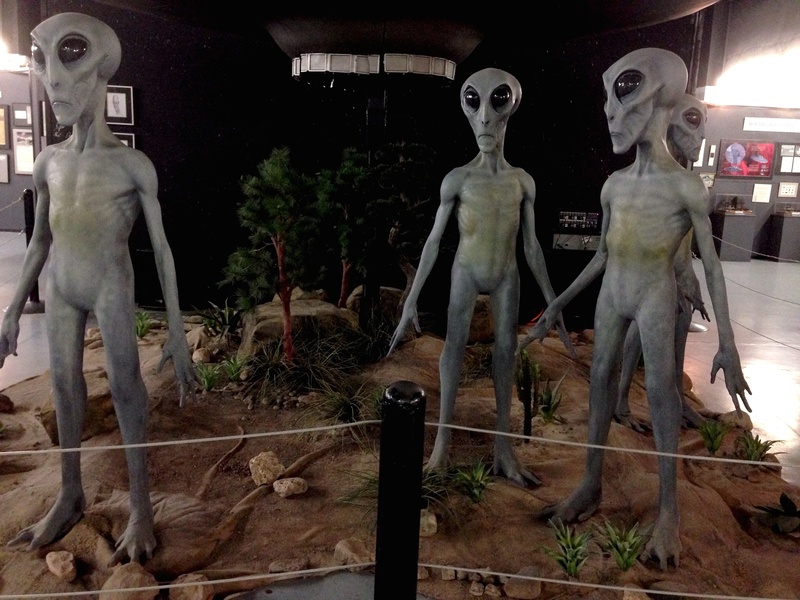 Actually it was at the Rosewell UFO museum where we visited these guys. 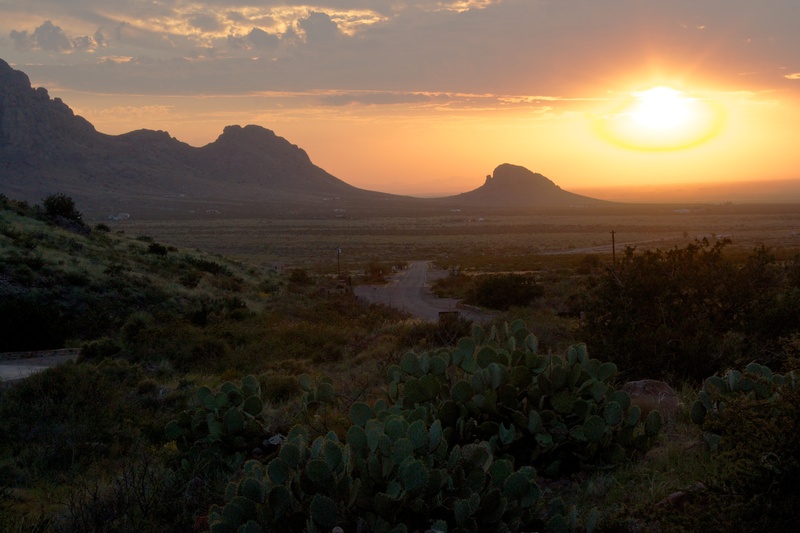 And finally to wrap up this truly enchanted land, another outrageous New Mexico Sunset, from our campsite at Rockhound State Park. We’re on our way back home, slowly…to spend some holiday time with our families and friends. 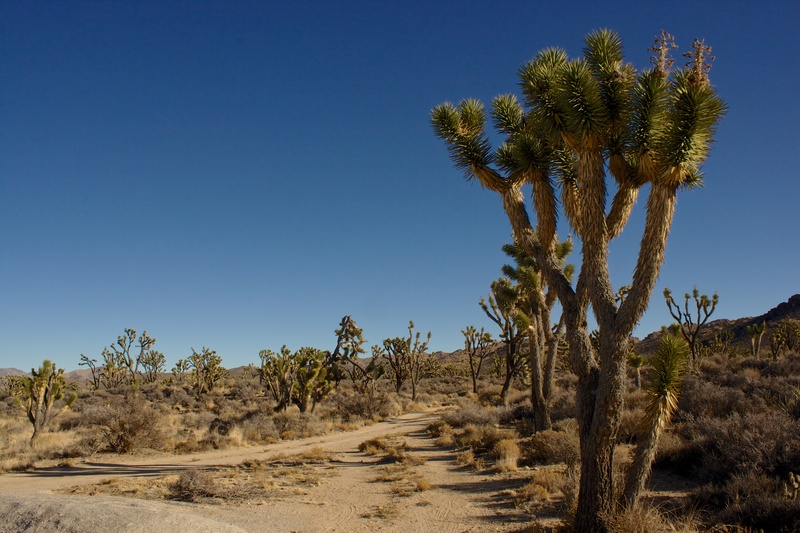 But first, we’ll tootle our way through the Arizona desert, and see what there is to see. 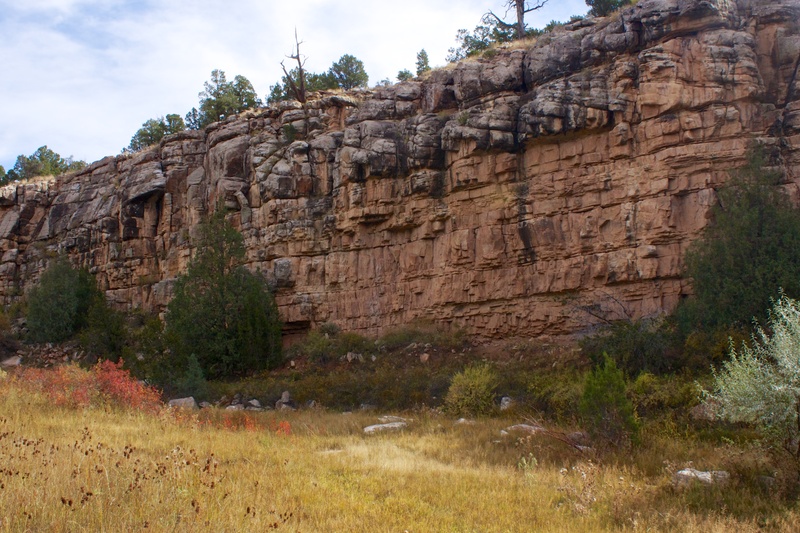 After leaving Santa Fe, we drove down past the town of Grants to Blue Lake State Park. We got in early, found a nice site overlooking the lake, and hiked around a bit. It was a nice campground and a good place to unwind from our sojourn in the cities. In the morning we all took a wonderful hike down to a creek in the bottom of another canyon…like a miniature Rio Grand Canyon. It was beautiful with cool rock walls, some beaver activity, and greenery along the creek. We even had to make a creek crossing, which Pia wasn’t crazy about…the water doesn’t bother her, but she’s not real keen on the boulders. Pia is a retired guide dog, and most of her life has been maneuvering around towns and cities, not bouldering up and down cliffs. But she is game to try most anything, such an amazing dog she is. So glad we didn’t just settle for the lake views, because this little hidden trail was the real gem of the campground for us. 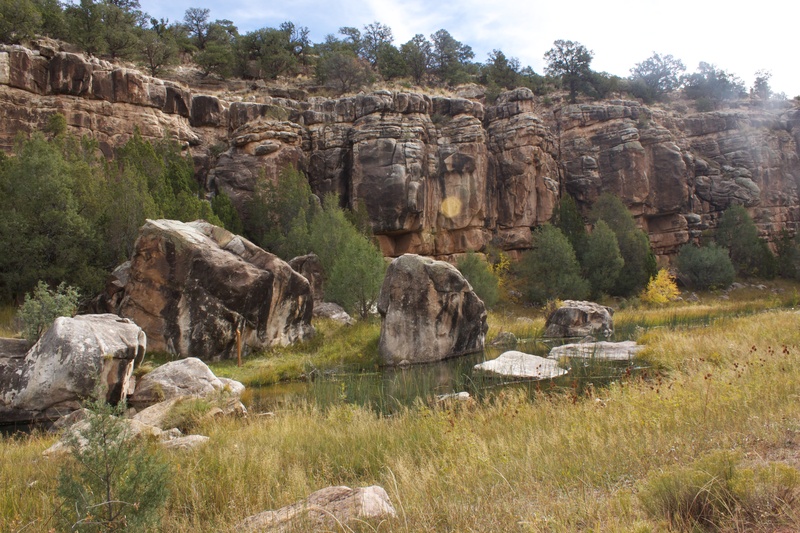 Checking out El Malpaias National Monument and Wilderness Conservation area was fantastic. We hiked around on these incredible sandstone formations overlooking acres and acres of lava beds at the Sandstone Bluff overlook area. Pia and Fred were tuckered out after all that boulder hiking, so Fred stayed behind with her at Lava Falls, where I hiked solo across a moonscape of lava beds, leaping over crevices, tiptoeing across lava bridges, and following the lava rock piles, which were the only trail markers on the trail. 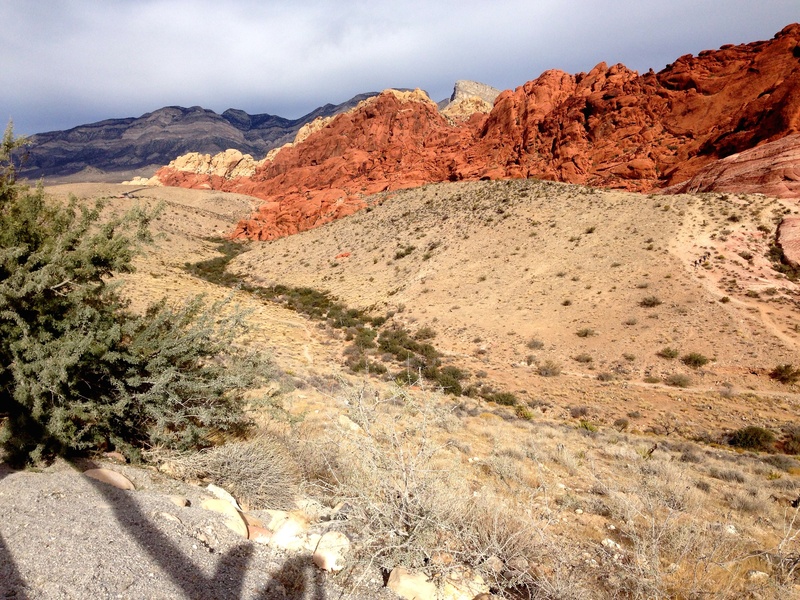 It was pretty rugged hiking, but an incredible landscape that I’m glad I was able to experience. The lava fields are about 3000 years old, fairly young geologically speaking. What was amazing were the trees, bushes and cacti that were forcing their way up through all the hard lava. 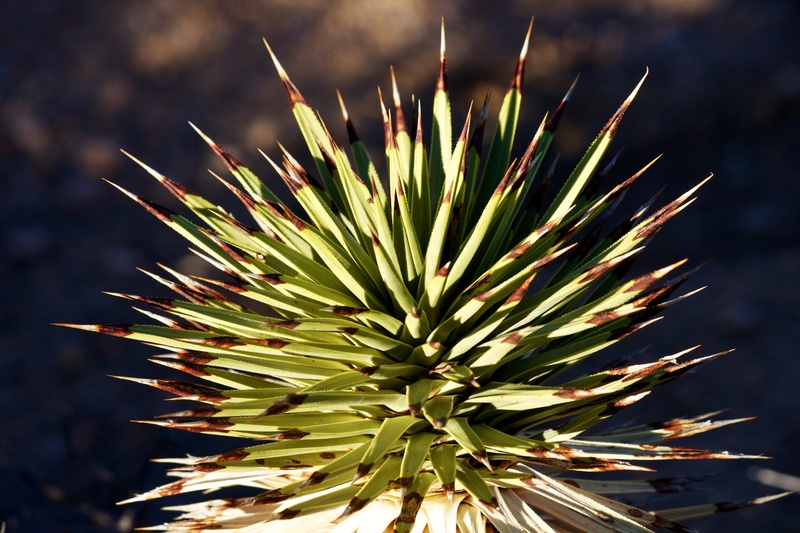 True pioneer species in a brand new world. South onward to spend the night at Apache Creek Campground. One last peaceful day along the Rio Grande River before we head south for good this time. 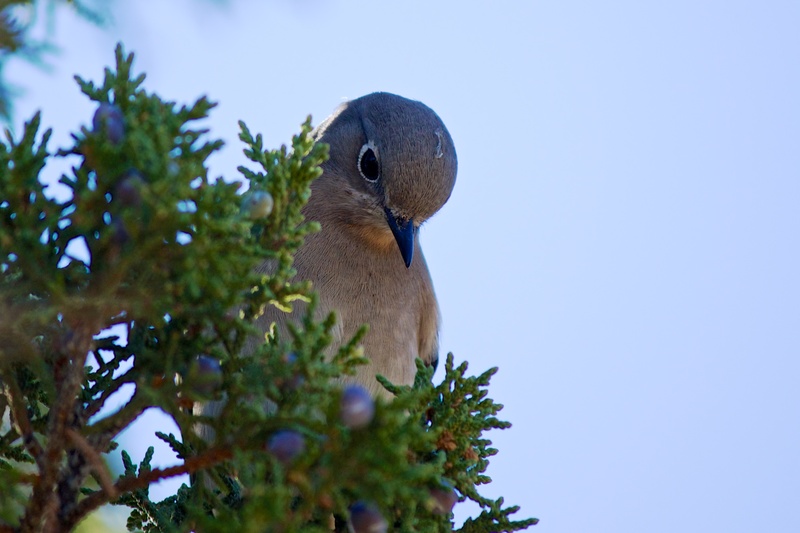 Our feathered friends waking us in the mornings. 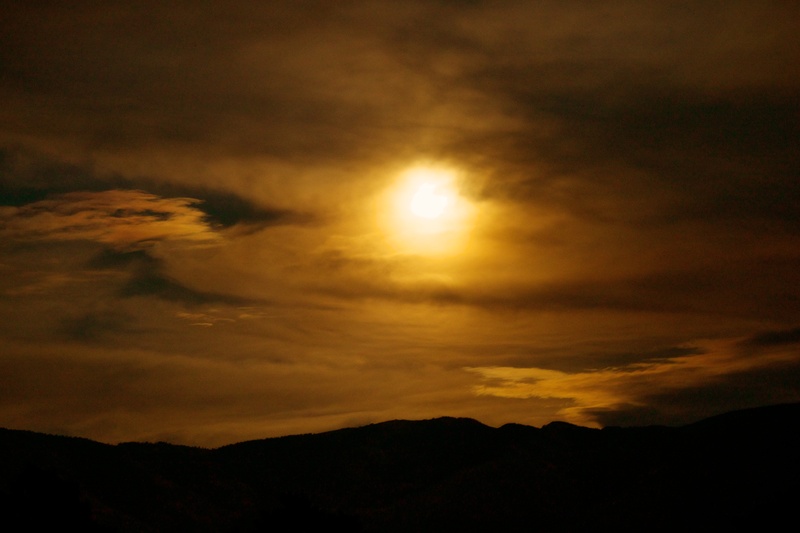 And those sunsets over the Taos Mountains in the Carson National Forest. We’ll dearly miss this, but its off to different lands. There’s much more to explore. 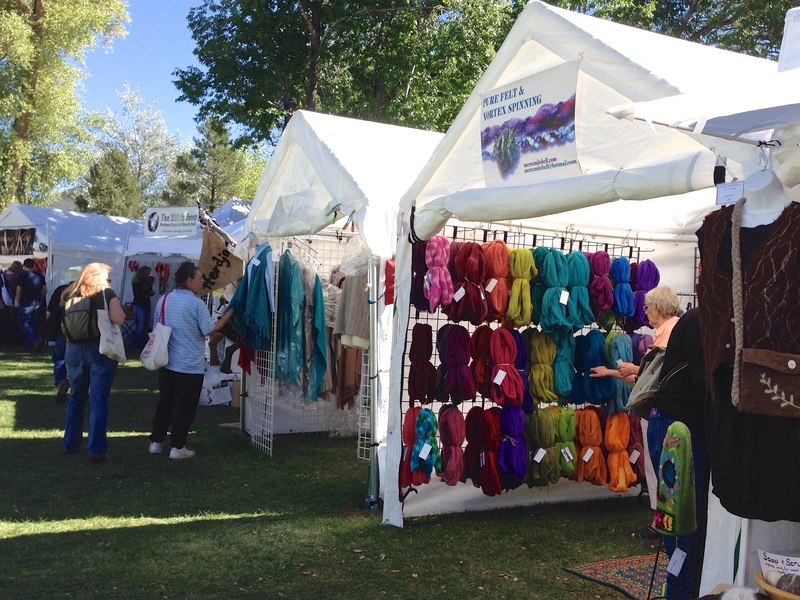 The festival was glorious, relaxed, and fun. Dogs were allowed to attend, which is somewhat rare for art shows, so Pia was happy, and we stayed a very long time. They even had a knitted dog sweater contest and fashion show, which I managed to miss while I was busy oohing and aahing and touching and swooning over textures and colors. And I caved. My whole not buying stuff just flew out the window, and it seemed that for every one little bit of yarn or fleece that I purchased, there was something else that needed to go with it. Bison yarn, Mohair solar dyed painted rovings, and natural plant dyed CMV rovings were just a few goodies I came away with, and a hand spindle, since I didn’t bring my spinning wheel along on this trip. 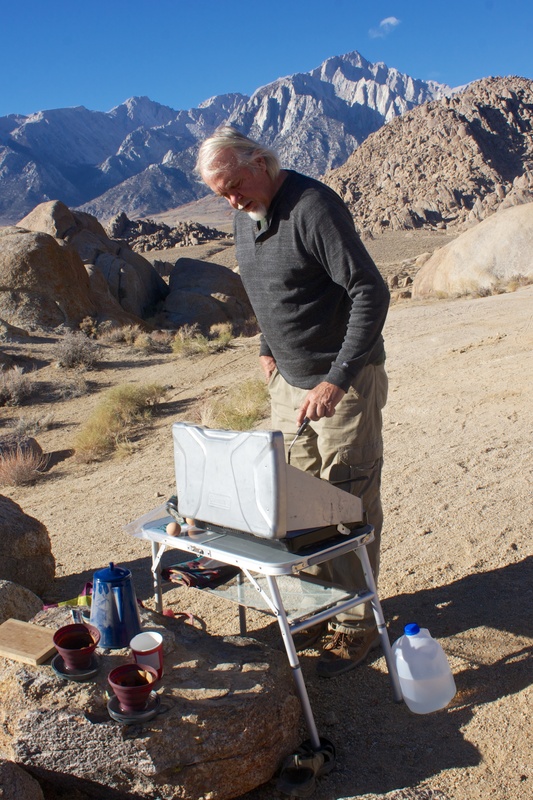 After the fair, we went and hibernated for a few days again along the Rio Grand Gorge wild river area and relaxed. I spent two marvelous days, spindling ( actually trying to remember how to spindle) and knitting, all the while watching birds out the van door. Leaving the gorge, we went on a bit of a fiber tour…first to Arroyo Secco and the Southwest Weaving Center, which was founded by Rachael Brown, the iconic weaver and dyer who started somewhat of a fiber renaissance back in the 80’s with her “Weaving, Spinning, and Dyeing” book. Rachael’s granddaughter and her husband now run the business, and teach classes in the shop. This trip for me was like taking a pilgrimage. We deviated from the fiber briefly to check out some Earthship Biotecture – some very green building architecture. We had to keep Fred happy too! We toured the visitor center, and nosed around some, oohed and aahed some more over these different types of textures and compositions. These houses are built completely from recycled materials, mostly old used car tires, and many many glass bottles, and are completely sustainable systems when finished. These houses can actually be rented out for overnight stays, which would be fun to do sometime. They are also for sale! After driving through mountains of more glorious yellow Aspens, we wound up in Mora, at the Mora Valley Spinning Mill, once known as Tapetes de Lana, where we took a private tour of the mill. After many years of processing fiber on a small scale (very labor intensive I might add) it was amazing to see the efficiency of this processing machinery as well as the art and love of the people who operate the mill. This mill has also totally rejuvenated an economically devasted community. So grateful for the time those folks took showing us around, I had to buy more yarn. This time I bought mostly Churro weaving yarns, Churro being the local sheep breed raised around these parts for fine weaving yarns. If I make purchases, I always try to find the most local of resources that I can. It’s great for memories and I also feel like it is wonderful to support the local economy of the communities that have made our trip so memorable. 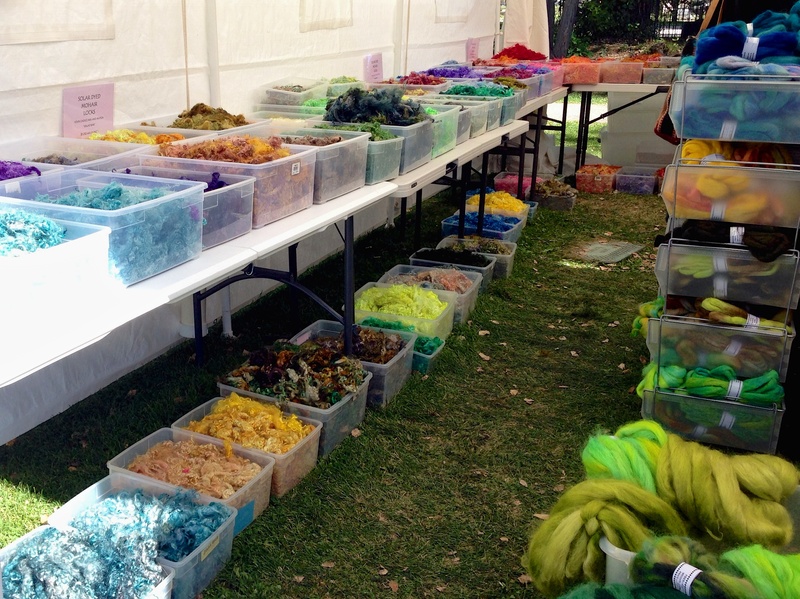 If fiber is not your thing, you might want to skip this gallery. It would take a lot more than this post to explain all the processes involved. Just think of it as a mini “Sheep to Product” journey. 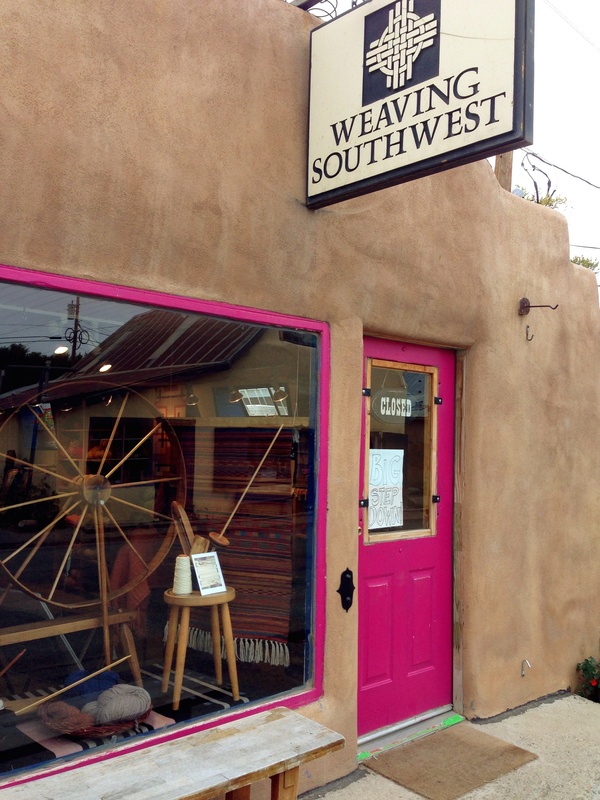 If all that wasn’t enough, we then drove through the little famous weaving town of Chimayo and stopped in at Centinela Chimayo Weavers, where world renown weavers Ivan and Lisa Trujillo have a studio and gallery. Not only were these the most exquisitely beautiful woven rugs I’ve ever seen, but the huge looms they worked on were amazing. Ivan and Lisa were actually out of town, but Cathy was so gracious, showing us all around, and answering a multitude of questions. Having her explain the history of the family, culture and weaving techniques was like an intense workshop all in a nutshell. 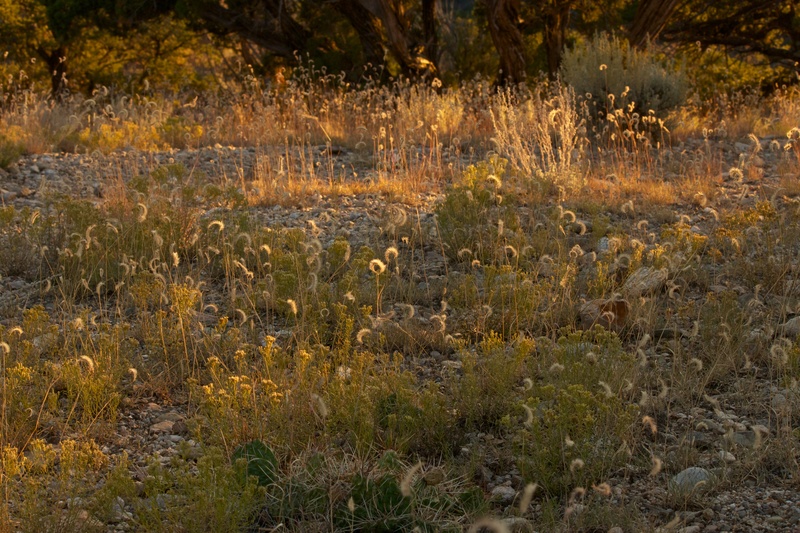 Each day, we fall more and more in love with this central New Mexico area. The history here, the cultural diversity, the arts, the beauty, the heritage is all just so mind boggling. 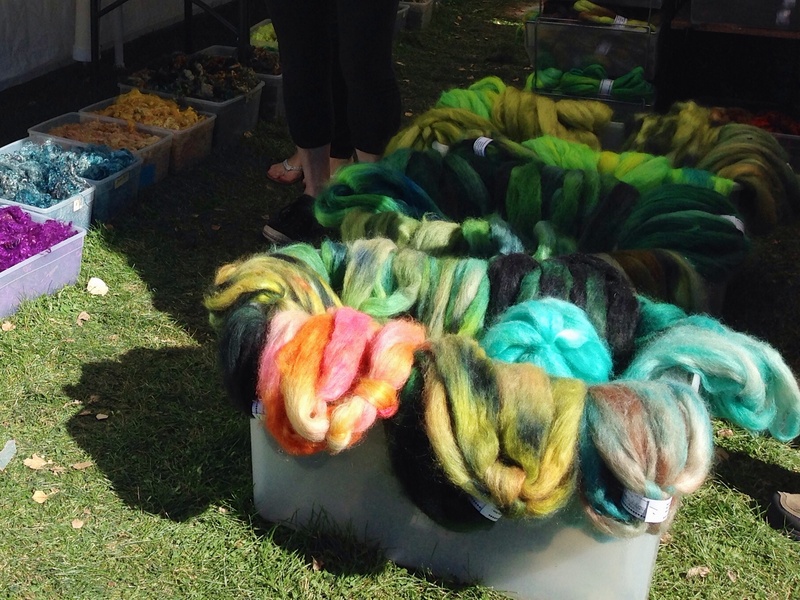 The links below will lead to fascinating explorations into worlds of Fiber, Green technology, Cultural Weaving and Cooperative Art and Business achievements. Enjoy the journey. We sure have.